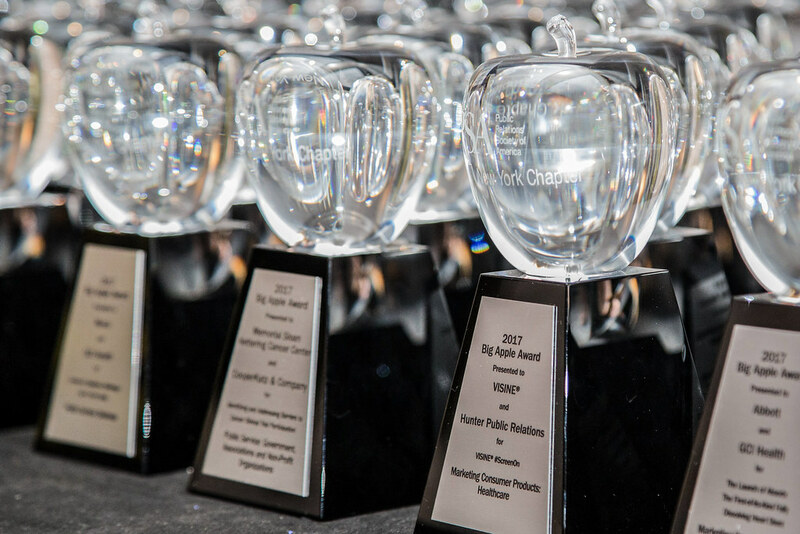 CONGRATULATIONS to all of the 2017 Big Apple award recipients and THANK YOU to the sponsors, partners and guests who helped PRSA-NY celebrate the tremendous work of our leaders, practitioners and clients during the 2017 Big Apple Awards Gala on Monday, June 12th at the Grand Hyatt New York. “GRAND” was the theme for the evening as #PRpros from across the metro area came together to honor outstanding individual achievements in PR and recognizing the most innovative and strategic communications campaigns or projects of the previous year. For 2017, the entire Big Apple Awards slate was retooled to better reflect the current work, techniques, talents and tools of communicators, marketers, and creative professionals. The Best Business/Campaign Outcomes title went to The TASC Group and Life Sci Advisors for “Not an Exact Science: Advancing Gender Diversity in Biotech. The 2017 Big Apple awards were presented by Arthel Neville, Fox News Anchor, Journalist and TV Personality, and Cheryl Wills, Veteran Anchor for Spectrum News NY1. Doug Doescher, Imaging Director for CBS Sports Radio Network, was announcer for the evening. The New York Chapter of the Public Relations Society of America established the Big Apple Awards program in 1987 to encourage excellence in public relations. The program has evolved to keep pace with a rapidly changing industry and continues celebrate the exciting and innovative successes of talented professionals working in the heart of the communications universe. Today, a Big Apple Award is recognized as one of the highest honors bestowed in public relations. "Need to Know for 2017"
Questions about the Big Apple Awards can be sent via e-mail to BigAppleAwards@prsany.org, or call 212.228.7228.